Come for the Culture, Language, and History Connection! Leave with your own art and insights to use in your classroom. Art + Culture + History + Language = FUN! What can teachers do or make relevant to Cinco de Mayo with their class? Who were the major players in Cinco de Mayo? Why is this Mexican celebration so important in the USA? If Mexicans celebrated with food and drink on the first Cinco de Mayo, what was it they most likely made for the celebration? Activity stations rooted in art and culture relevant to Cinco de Mayo. View this flyer in a printable format here. 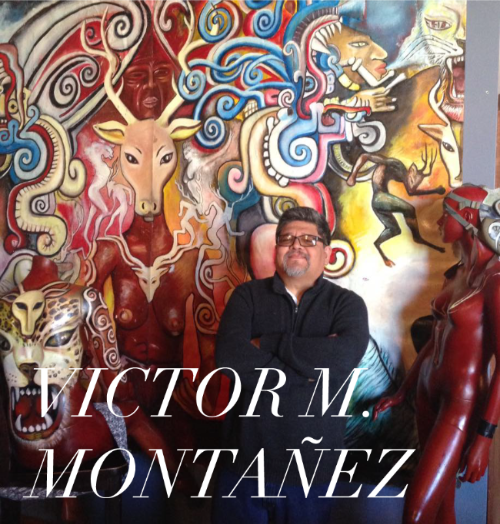 Presenter Profile: Victor M. Montañez is a life-long artist. He was director of artists’ recruitment for Albany Park’s People’s Arts Festival. He chaired the first two Milwaukee Avenue Arts Festival, Artists Recruitment committee and was a key organizer of The Midwest Lowrider Celebration of Culture for more than two decades. Victor Montañez is the originator of “Empowerment Art” – an art form known for its distinct feature of allowing viewers to display the same artwork in multiple arrangements, each arrangement depicting various protagonists. Know Art, the term coined to describe it, can be found in various places around the country. The largest concentrations of his public works are in the Midwest and Northern New Mexico. Know Art is art that embodies options and changes, like leaders and activists try to bring about change and transformation to communities. Know Art goes beyond simple technique and style. It is less about aesthetics than it is about empowerment. The art mirrors the struggle for social justice through participation and democracy. Innovations and Honors: Victor Montañez was featured in “Americanos, Latino Life in the US,” an award-winning documentary film produced by actor/activist Edward James Olmos for HBO. The documentary featured 14 stories including greats like Carlos Santana and the late Tito Puente. Victor was chosen based on his advocacy promoting peace among all races through art and multicultural gatherings. Victor Montañez’ life, became the inspiration for one of the lead characters in The American Theater Company’s, Chicago Chronicles III. Chicago Chronicle is a docudrama project of American Theater Company that partners eight professional playwrights with youth leaders in the Logan Square community. These playwright/student teams conduct an exploration of the Logan Square neighborhood by interviewing family members, business leaders, community leaders and others. Based exclusively upon these interviews, the playwrights then craft a docudrama play that is performed at American Theater Company by professional artists. In October of 2011, Victor Montañez was recognized with the Award for Excellence in Fine Arts by NEIU Latino Heritage Committee. In 2012, as part of a celebration by Logan Square Neighborhood Association turning fifty, Victor was honored by the youth leaders of the Chicago Northwest side organization as one of the 50 neighborhood heroes included in a book, for his advocacy, activism, and promotion of multi-cultural initiatives. Education Advocacy: His involvement in education spans more than three decades. At the age of eighteen, Victor and Brother Modesto Leon started the alternative high school model for troubled youth, SEA, in East Los Angeles. Eventually he taught English, History, and Algebra for SEA. Today, 36 SEA high schools operate under the same model in the USA. In 2009, the SEA model was featured in the history Channel’s documentary series on gangs. Victor Montañez is a nationally recognized expert on educational policy and urban school reform. He has been a featured presenter on education leadership, and pedagogy issues at national and international conferences sponsored by the World Bank, The Ford Foundation, The Hazen Foundation, The Annenberg Foundation and the Kellogg Foundation. Mr. Montañez was policy co-director for Designs for Change, the premier school reform and educational research and advocacy organization that led the way for the historic school reform movement in Chicago. During that tenure, he presented throughout the United States in major urban areas and represented the United States at the International Conference for Education Reform in 1994 in Santiago, Chile, South America. He now serves on The DFC Board of Directors.